Cooling tower corrosion may not be evident outside, but inside can be a different story. Introducing RepelCoat, a protective coating system that eliminates corrosion – for cooling towers, fan shafts, pipework, tanks and vessels. We offer a complete corrosion repair and restoration service. Available in Vic, NSW, SA. The cooling tower environment poses exceptional challenges to steel materials. Over time, steel must withstand the natural corrosive effects of water, constant aeration, bacteria and a swathe of chemical agents. Coolclean’s RepelCoat system eradicates corrosion, by forming a hard-wearing protective barrier that bonds with steel and repels corrosive elements. Surface preparation is combined with advanced epoxy technologies to protect steel in very harsh environments. The Coolclean RepelCoat system includes surface preparation to AS 1672.4. 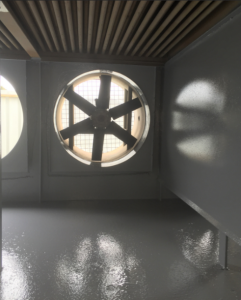 Our customised coating services are programmed to minimise disruption to your operations, and are delivered efficiently, on time and on budget. FIBREGLASSING: A lining. Fireglass will not flex with the steel. It will crack and water will leak behind the lining. MEMBRANES: A lining. Membranes are flexible rubber-type products, which will lift away if cut or scraped. Water will leak behind the lining. PAINTING: A lining. 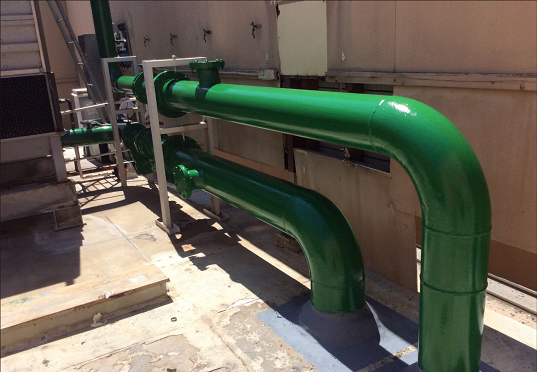 Paint will not stand up to the harsh conditions within a cooling tower. It will crack, peel and lift away as it is not designed to chemically bond to the steel. Water will leak behind the lining. CONCLUSION: All linings will fail over time, and they are known to cause significant ongoing issues. 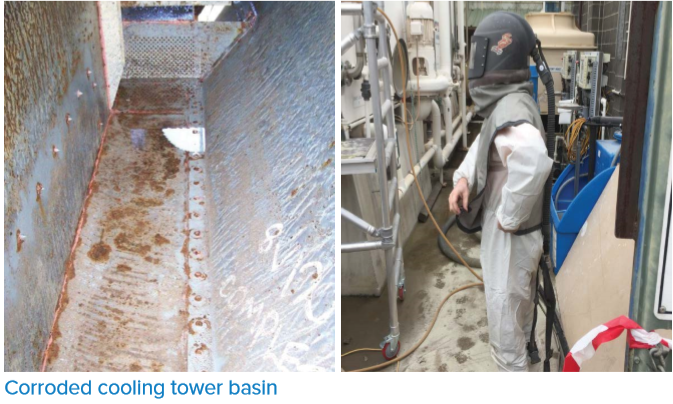 Why is it important to address cooling tower corrosion? • Corrosion interferes with water treatment programs and mechanical maintenance. • Where there is corrosion, Legionella bacteria is likely to be present. Increased levels of Legionella bacteria compromise risk management, safety and compliance. • Once a basin is corroded, the process can accelerate quickly. Without effective intervention, large sections, or the whole tower may need to be replaced at significant cost. Coolclean coating solutions are suitable for all steel cooling towers, including Aquacool, BAC (Baltimore Air Coil), Coolmaster, Evapco, F Muller, Fibreflow, Fibre Tech, Gatorade, Hamon, Hydrothermal, Lakeside, Linear, Marley, Muller and Radic.